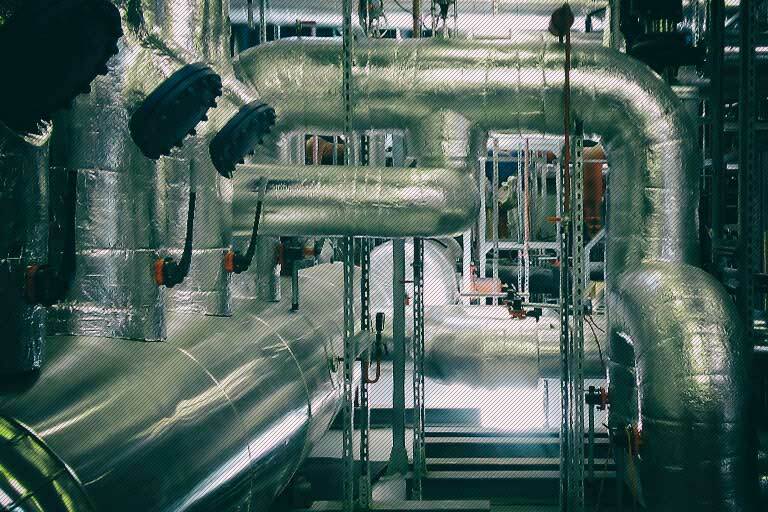 We supply and install thermal, cooling, acoustic, and fireproof insulation for commercial and industrial construction projects both in the CR and abroad. In commercial installations, we primarily implement building technology (heating, cooling, air conditioning)—most frequently, vacuum drainage of roofs, sanitary facilities (gas, water, sewer), sanitary equipment, central heating, cooling (air conditioning), protection of structures and fire protection systems for structures and equipment. 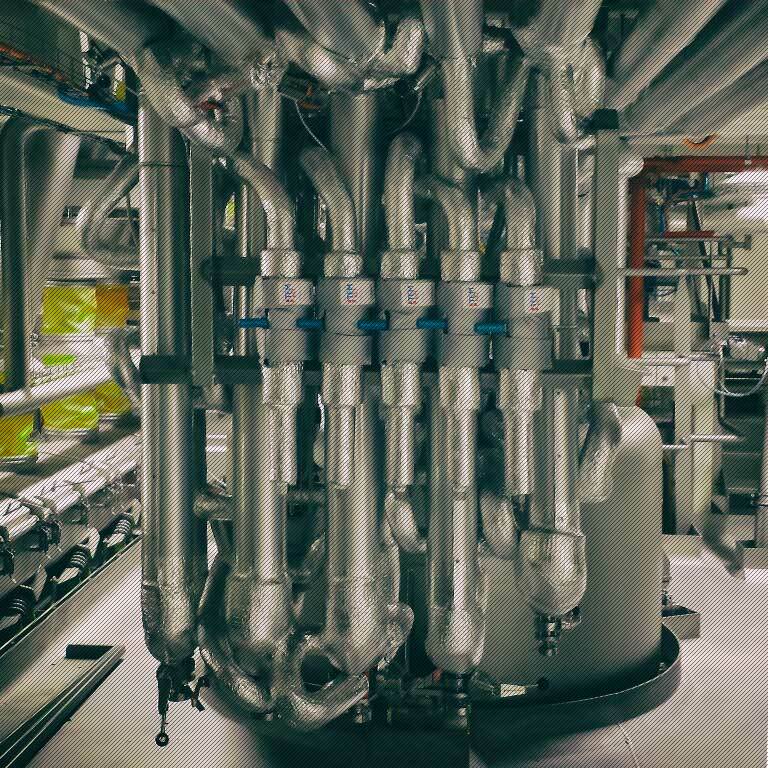 In industrial construction, by contrast, we work with insulation for temperatures ranging from -50° C to + 1850° C. This includes insulation for steam equipment, hot water systems, cooling equipment, and various types of acoustic insulation. We do all this insulation work on piping systems, various types of solid objects, boilers, heat exchangers, and transfer stations, using mineral wool and fibre glass, various types of ceramic fibres, polyethylene, and rubber insulation materials (mats, panels, and pipe sleeves). The SAINT-GOBAIN comprehensive system for the manufacture of self-supporting air ducts composed of insulation panels double coated with fiberglass. Rubber insulation is a highly flexible insulating material with a closed cell structure. It is characteristic for its high resistance to water vapour diffusion and low thermal conductivity. It is used as thermal insulation and isolation against the formation of condensation for the insulation of pipes, air conditioning ducts, and tanks for cooling, air conditioning and technology equipment. Rubber insulation comes in the shape of pipes, panels, and tapes. In addition to the regular insulation material, self-adhesive products are available that significantly shorten the installation time, as well as products coated with ALU foil. Polyethylene insulation is made using polyethylene foam with a closed cell structure which is characteristic for its low volume weight, low thermal conductivity, flexibility, non-absorbency, and the ease of use. It is used as thermal and/or acoustic insulation, or as mechanical protection against an aggressive environment. Polyethylene insulation comes in the shape of pipes, panels, or strips. Various types of surface treatment are available (e.g. ALU, polymer, LDPE, and HDPE foils, etc.). Rock wool is the name for thermal insulation manufactured using molten rock basalt. That means the material is always derived from a natural source which is melted during manufacture. The melt is separated into individual fibres that will make up the thermal insulation. By adding a binder, rock wool is created. The material is sometimes also referred to as mineral wool. Rock/mineral wool products come in the shape of mats, panels, or strips. They are manufactured with no surface treatment or, e.g., with reinforced ALU foil, zinc wire, etc. Fiberglass is the name for thermal insulation manufactured from glass wool. The natural product is melted, separated into individual fibres, and applying an additional manufacturing process, thermal insulation is made. This material has outstanding thermal and insulation properties and is acoustic, vapour-permeable, non-flammable and compressible, making it easier to transport. Fibreglass products are in the shape of plates, rolls, or may be applied as blown insulation. Foamglass is thermal insulation comprised of millions of hermetically sealed cells. Because of its structure, FOAMGLAS® is vapour-permeable, non-absorbent, non-flammable, shape-stable, resistant to acids and rodents, and has exceptional compressive strength and stiffness even under long-term loads. Working on a project we can apply surface treatment—as requested by the customer—to all types of insulations. The edge we offer is surface metalwork. We work with aluminium and galvanized sheet metal, either in its natural form or in a range of colours. We also use stainless steel for surface treatment. Metalwork is carried out using MABI, a Swiss computer-controlled machine for the manufacture of pipe components and cutting straight parts, and other high-quality machines. Thereby, we ensure high quality or workmanship and speed, as well as high degree of precision and efficiency. Among other types of surface treatment is the use of PVC (e.g., Okapak, AL CLAD etc. ).